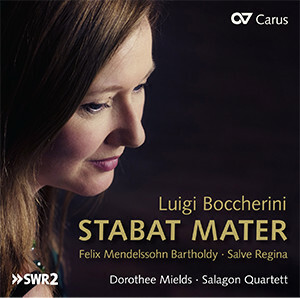 Although vocal music accounts for only a small part of Luigi Boccherini’s works, his Stabat Mater G. 532 is one of the most exquisite settings of this sequence from the 13th century. 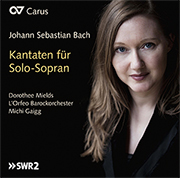 The first version is recorded here; it is scored for soprano and string quintet and dates from 1781. 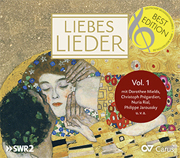 It captivates the listener by the intimacy of Boccherini’s musical language which is particularly suited to the contemplative poetry depicting Mary’s anguish during her son’s crucifixion. 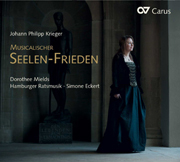 One could wish for no better performer of this subtle sacred music than the incomparable Dorothee Mields; she is accompanied by the Salagon Quartet augmented by double bass. 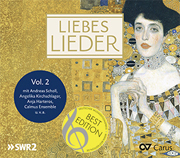 The recording is complemented by Mozart’s String Quartet in E flat major KV 428 and the Salve Regina by Felix Mendelssohn Bartholdy: composed in 1824, it is frequently considered one of the youthful composer’s best works.